San Diego State Red & Black Spring Game. Mandatory Photo Credit David Frerker. 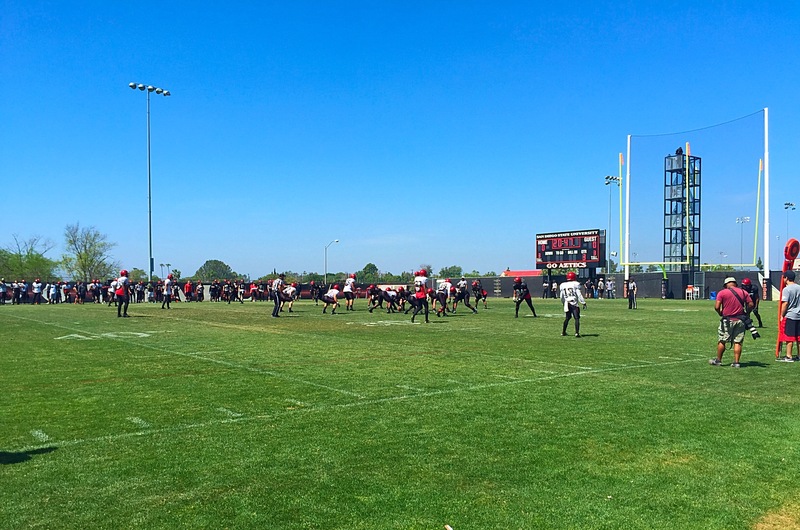 The annual San Diego State University Red & Black Spring Game was a success. I am going to say we had between 700 to 1,200 fans on hand for this spring game (Please keep in mind that is not the official attendance). The first 500 fans in attendance received a free Kabeer Gbaja-Biamila replica jersey. It was also the first opportunity for season ticket holders who renewed during the early renewal period to pick up their Aztec “Rise Up” pint glasses. It was a perfect day on the mesa for a football game. The weather at 72 degrees with a slight breeze was perfect. The only thing that impressed me today about the San Diego State offense was the running backs. Donnel Pumphrey the ALL STAR Aztec running back did not receive any action today in the back field and that was to be expected. The star running back did have punt return duty. His two back ups Rashaad Penny and Marcus Stamps ran all over the San Diego State defense. The two backs combined for 28 carries for 209 yards (7.4 yards per carry) and 2 touchdowns. Both Penny and Stamps exploded for runs of 60 + yards. In the second quarter Penny broke a 60 yard run which ended five plays later in a Stamps two yard TD run. In the fourth quarter Stamps broke a 67 yard run which ended two plays later in a Stamps four yard TD run. The fans in attendance got to see five of the six quarterbacks on the San Diego State Roster (Jake Rodrigues, Christian Chapman, Nick Bawden, Maxwell Smith and Adam Wood). I was only impressed by one QB today and that was Oregon Transfer Jake Rodrigues. Rodrigues was able to hit Paul Pitts on the run for a 55 yard pass. The Aztec QB’s were a combined 9-29 for 166 yards and 2 interceptions. The game ended up being a defensive struggle thanks to Head Coach Rocky Long and his hard nosed defense. If you have never watched a San Diego State game before you would not notice the fact that SDSU has had some problems in the linebacking core this spring. Calvin Munson, Jay Henderson, Malik Smith, Micah Seau, Aaron Boesch, Malcolm Jackson, Jon Sanchez, Kalan Montgomery and Devante Davis combined for 10 tackles for loss. Those 10 tackles added a net loss of 41 yards for the Aztec offence. The Aztec defense also got into the faces of our five quarterbacks who luckily were not aloud to get hit. Calvin Munson, Jay Henderson, Malik Smith, Micah Sea and Malcolm Jackson combined for five sacks on the day. Those five sacks totaled net loss of 25 yards. The Aztecs were able to create some turnovers today in the form of two interceptions. Interceptions by defensive back Kendrick Mathis and linebacker Daryl Dunlap. The interception by Kendrick Mathis was returned 27 yards for the score.